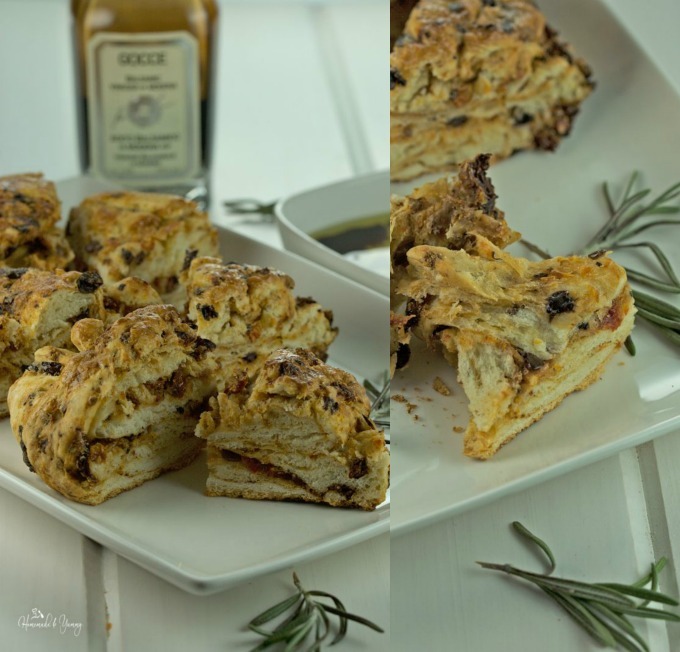 Black Olive & Tomato Bread | Homemade & Yummy Homemade & Yummy | Fun delicious recipes and more. There is nothing like the aroma and taste of homemade bread. 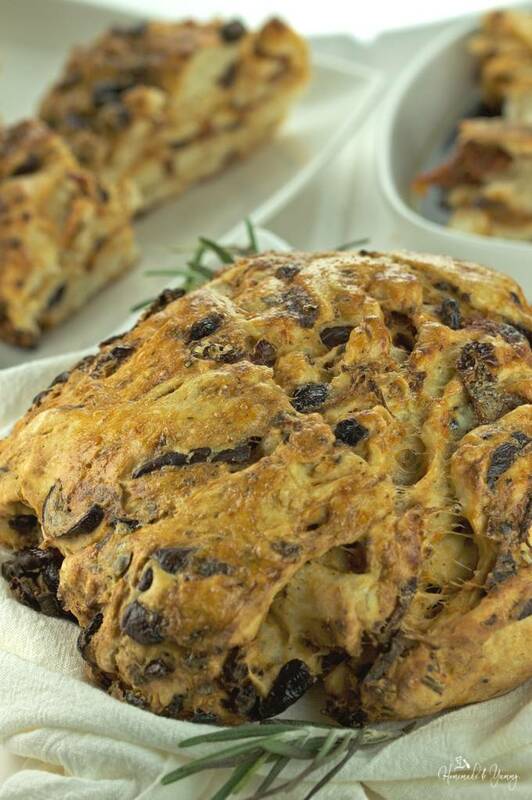 This savoury Black Olive & Tomato Bread is perfect for dipping into olive oil and balsamic vinegar. Bread is one of my favourite things to eat. Making homemade bread isn’t as hard as it may seem. For me it brings on a sense of accomplishment. Knowing that my baba made bread from scratch ALL the time, it was time to step up to the plate and make some myself. I am a bread fanatic. Seriously if I had to choose 3 things to take on a desert island to eat, one would be bread (the other 2 would be wine ?and cheese ?). I love artisan breads, and the more savoury the better. Dense sort of loaves filled with pieces of olives, tomatoes and herbs. We love nothing more than breaking into that fresh bread and dipping it in oil and balsamic vinegar. That to us (along with some wine) is the perfect way to spend an afternoon chatting with friends. As a child I remember my baba always making bread from scratch (that and everything else she cooked). You could smell the bread baking as you got close to the house. Waiting for it to come out of the oven and cool enough so I could get a nice thick slice slathered in butter. That was THE BEST after school snack going!! We all get busy and baking bread gets put on the “to make” list for one day. I decided today was that day. It was a labour of love that came with the satisfaction of making something wonderful. It isn’t as hard as you think, and the results are so worth the effort. I just love breads filled with lots of chunks of goodness, to me bread is all about the ingredients. This Black Olive & Tomato Bread is exactly up my alley. 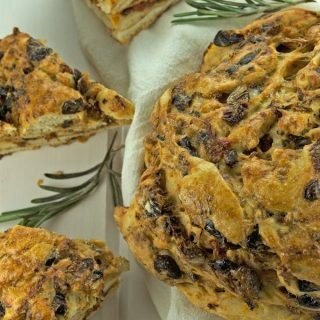 Loaded with olives and sun-dried tomatoes with the addition of fresh rosemary, this bread shows off your bread making skills and gets your mouth watering as you smell the aroma while it bakes. Making bread takes a little work and a lot of patience. You mix/knead your ingredients and then it really is all about the rising/waiting and baking. It’s something you cannot hurry along, it is ready when it’s done! I think the big thing that scares people about making bread is failure, perhaps it won’t rise or it won’t bake properly. You will never know if you don’t try. Yes I do agree that people like my baba could do this with their eyes closed because they know how the dough should feel. Once you do this a few times you will get to know that feeling too. I have a few books on bread baking so I looked though them to find one I would like. My Black Olive & Tomato Bread was adapted from a recipe in Making Fresh Bread. 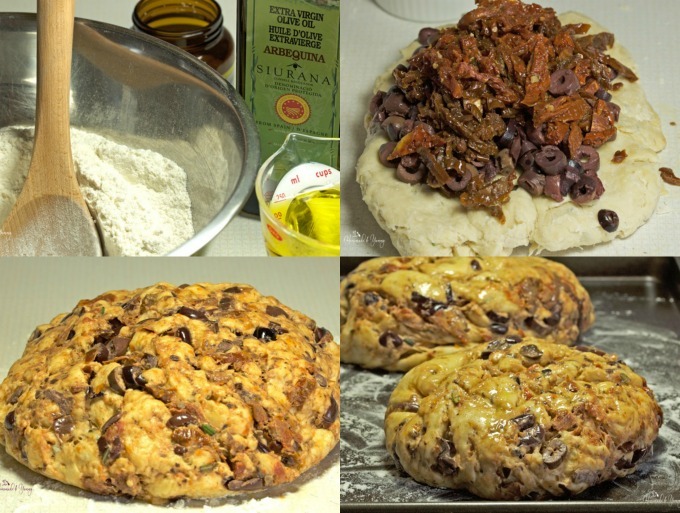 I chose black olives, sun-dried tomatoes and rosemary as my ingredients. I mixed everything together, kneaded until it was smooth. Put it away for about 1 1/2 hours to rise. Divide the dough into 2 balls and place them on a baking sheet and let them rise some more. When they were ready I made some cuts in them, brushed them with egg and baked for about 40 minutes. Oh the house smelled wonderful as these baked. I could not wait to break into these little beauties and dip them in oil. If you want the satisfaction of doing something that is a labour of love, head into the kitchen and bake some Black Olive & Tomato Bread. Once you have, I just know you will be going back to bake more!! 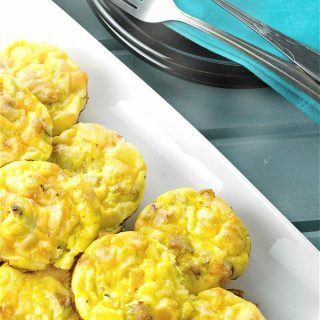 Hungry for more bread check out: KK’s Cheezy Cornbread or for a muffin try some Savoury Cheddar Onion Muffins. Have you signed up for my WEEKLY NEWSLETTER? Grab your FREE printable when you do. 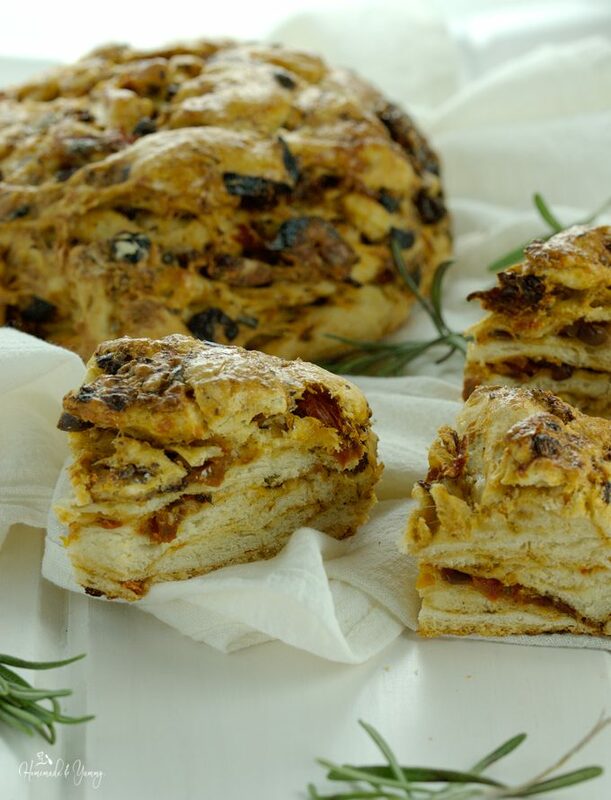 Black Olive & Tomato Bread is full of savoury flavour packed with pieces of olives and sun-dried tomatoes. Perfect for dipping. In a large bowl sift flour and salt. Add in yeast, sugar and rosemary and mix. In a cup mix the oil and water. Make a well in the centre of the flour mixture and pour in the oil/water mixture. Stir with a wooden spoon until dough comes together. Using your hands, knead until it holds together. Turn dough out onto a floured surface, and knead a few times. Flatten slightly and layer on olives and tomatoes. Roll like a jelly roll, then continue to knead for about 5 minutes until dough feels smooth. Brush bowl with oil and place dough into bowl. Cover with plastic or damp dish towel and let rise in a warm place for about 1 1/2 hours (or until dough has doubled in size). Dust cookie sheet with flour. Turn dough onto floured counter, punch down and cut in 1/2. Shape each 1/2 into a round. Place them on the cookie sheet, and cover with plastic or damp cloth. Allow to rise for another 45 minutes in a warm place. While the dough is rising turn oven to 400º F.
When dough is ready, make 3 shallow slashes across the top of each loaf, and brush with beaten egg yolk. Bake in preheated oven for about 40 minutes until golden brown and the loaves sound hollow when tapped on the bottom. Remove from pan onto a wire rack to cool. I am Mediterranean living in US. As you may know we cannot live without bread, olive oil and feta. This is by far the best homemade bread recipe. I tried it yesterday and it is all gone. I used a little more olive oil, probably because dried tomatoes I chose were not deeped in oil and were extremely dry. Next time I will make it thinner, cut in half and use it as a sandwich bread. THANKS so much for letting me know. So glad it turned out well for you. I can imagine the aroma as this baked. Happy eating. I could eat that whole loaf all by myself. It looks so doggone good. I may have to fight Hubby for it. He’s an olive fiend. He would eat his weight in olives. Bread is a weakness — wait!! It’s the staff of life. So if I make this delicious black and olive tomato bread it is adding to my life. YES!! That’s what I like to hear. I’m pinning!! Well you know as well as I do…homemade bread is the best!! 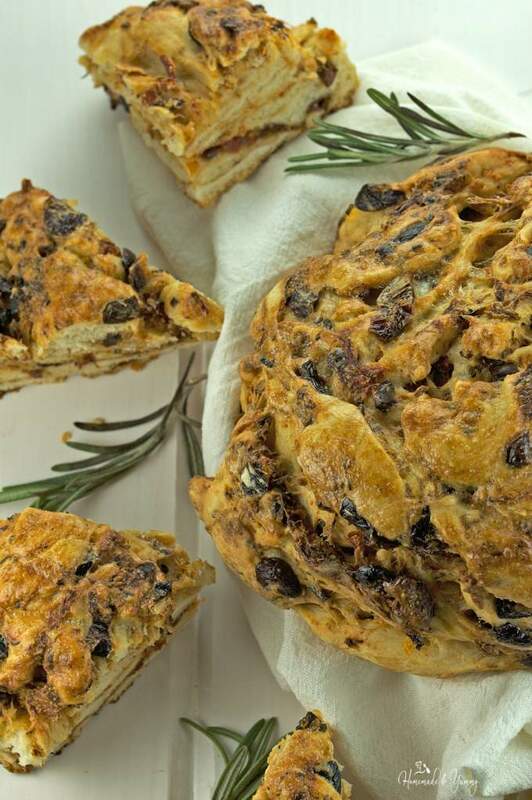 This has got to be one of my favorite breads – I love black olives and sun dried tomatoes in my bread.. yum. Yours looks so crusty – Love it. I am addicted to black olives…especially on bread. Oh, I love this recipe and the addons to the bread! I’m with you – bread is one of my favourite things to eat! Nothing better than the smell of freshly baked bread. 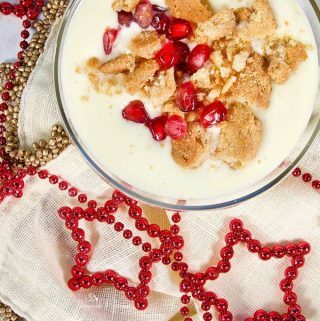 I don’t know how I missed this wonderful recipe of yours!! HHAHA…yes I cannot give up bread, but this helps so I don’t eat is as often. Oh it really is delicious! Yup I could too….love it!! Great post Gloria! I’ve been experimenting with a few different bread recipes with mixed results. (Sigh) I appreciate this post because it inspires me to keep going and keep tweaking until I have something as delicious looking as yours! Thanks Jared…..it really is trial and error. Keep at it….and I say even if it doesn’t turn out perfect…it is still yummy!! Glooooorrrriiaaaaaa… I want a whole loaf of this right now. Like you, bread is one of my favourite things to eat. Like, for realz. And black olive bread is my FAVOURITE bread. It’s making me write really long and uppercase words 😉 Seriously – this looks divine woman. We will have to have some bread and wine and cheese together, asap. YES…I would love to get together with you…that would be awesome!! There’s something so satisfying about making your own bread. And I find kneading the dough is a great stress-reliever. This bread looks amazing! Thanks for sharing it. Totally agree about making bread…thanks!! What a cool bread. There’s so much going on, and so many layers of flavour (not to mention layers of bread – love the almost laminated look to the cut loaf). Plus I’m a sucker for fresh rosemary! This bread looks so good. I love olives so will have to try this next time I make bread. Thanks! I love olives too…but only black olives!! This bread is beautiful and looks delicious too! 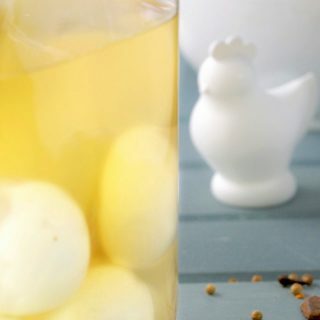 I will try this recipe very soon! Could I use store bought pizza dough? I don’t really think you would get the same consistency. Make it from scratch..it’s worth the effort. I’m pretty sure I could survive on bread, cheese and wine too 😉 And chocolate! This bread is gorgeous! Thanks so much…yes chocolate for dessert!! I am such a fan of olives! 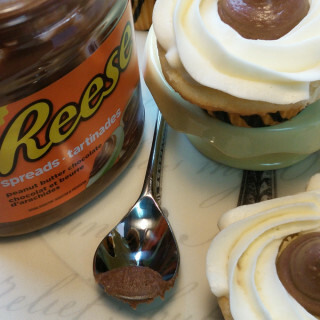 I’m definitely going to make this. Thinking possibly for the next brunch I go to! Oh I hope you give it a try….it is delicious!! This looks amazing. I would love this for a side dish. I am going to have to give this a try. Thanks for the inspiration! Hope you enjoy baking bread!! This looks so good. I love olives and I think they would be great on that bread. I love olives and it looks delicious. I’ll have to give this a try! Thank you for sharing. Hope you do it is delicious! People do seem to be scared of making bread don’t they? I think it is something that you need to feel, rather than just follow the recipe? I love yours, so rustic and all those delicious olives and tomatoes. Yes I agree…but you will only get the feel if you try!! This looks fantastic! I’m kind of a black olive fanatic- if I buy them in a can I tend to eat the entire batch ack! Putting them in a bread with sundried tomatoes sounds decadent. Yes for sure…give it a try!! Hope you do….it sure is worth it!! My mom would love this bread. She love her black olives to pieces. I so need to make this for her for mother’s Day. She would LOVE it…that is the perfect gift!! I absolutely love olives- can’t wait to try this bread! I’m so intimidated when I think of making my own, but you definitely make it look easy. ? Just give it a try….you will be surprised!! How i wish i could bake breads!! I am so scared of yeast… but looking at this, I think I should just quit being a chicken and give it a try soon. 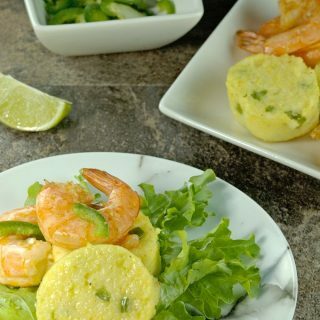 Head into the kitchen….you will be amazed!! This recipe sounds delicious. It would be really good dipped in Italian butter too! 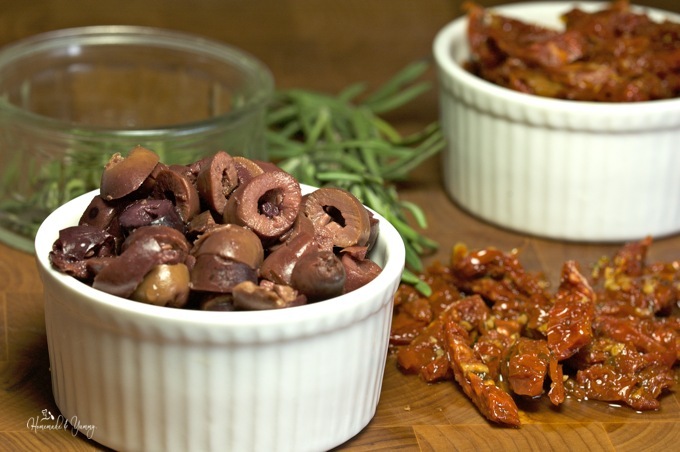 I would pick out all the olives and give them to my hubby but sun dried tomatoes are one of my fav ingredients. Pinning to my Bread board for later. Hope you give it a try!! I love the rustic, ruddy look of this bread and I would like to join you for the wine, cheese, bread afternoon. Just let me know when! That would be so much fun…wish we could!! Thanks for the compliments!! Wine, cheese and bread – I want to be stranded with you, LOL This bread looks amazing! Yup….those are the important food items to be stranded with ? This looks amazing and it has my mouth watering! 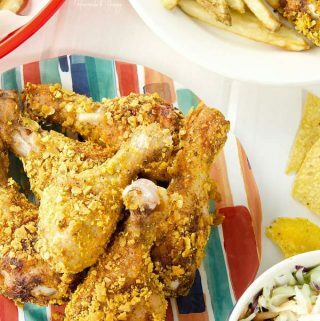 This would be great to pair with a cheese board and some great red wine! Oh yes….lots of red wine and cheese…perfect!! This stunning bread definitely looks like it’s worth the labour of love. The flavours sound great. It was really enjoyable to make!! 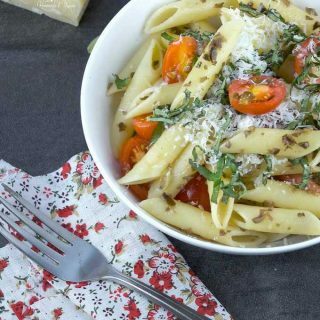 I wonder how would this turn out if I use fresh cherry tomatoes and basil? Sounds good! Give it a try and let me know….sounds delicious! !